Tucked away in the 11th arrondissement, a pebble’s throw from the Place de la République lies a hidden gem in the Parisian English comedy scene. Founded in 2012 by Robert Hoehn, the French Fried Comedy Night takes place every Tuesday evening around 9pm at Le Paname Art Café (14 rue de la Fontaine au Roi, 75011). The show is free with the purchase of a drink, so on arrival at Le Paname my friend and I headed over to the bar where they offer a list of wines for 5-8 Euros, a nice list of cocktails in the 10-12 euro range as well as a selection of non-alcoholic beverages. After serving our drinks, the bartender gave us tickets which granted access to the event room downstairs. This was a perfect time to mingle with the other audience members. We chatted briefly with some of the comedians and regular attendees before the show. It was a great opportunity to get a feel for the audience and meet some fellow expatriates in Paris. At 9:30pm, the energetic comedian Phyllis Wang, hailing from the USA, jumped up onto the stage, ready to get the show on the road and start warming up the crowd. As host of the French Fried Comedy Nights, she is in charge of organizing the comedians as well as back room details. We hadn’t brought tissues which we could have used because we laughed so hard over the next hour. The audience was entertained by a fondu pot of comedians, each one hailing from different parts of the globe including Luke Thompson with his advice against using BBC as an aide in learning English, Alexander Van Walsum and his hilarious lesson on French expressions such as “faut pas pousser mémé dans les orties” and Paul Taylor’s recount of his first experience with la bise, as well as many others. Acts were limited 5 minutes and in that time they tried vigorously to get the audience rolling with laughter. Most of the acts were successful, filling the room with giggles and a few snorts but a few jokes fell shy of hitting the mark. Perhaps it was because of a language barrier? There were few visiting comedians along with the normal troops which was a nice addition to the regular crew. I advise to arrive around 9pm to ensure you have time to order a drink before the room downstairs opens up and the seats begin to fill. Make sure to bring your sense of humor and perhaps some tissues. The French Fried Comedy show is perfect for a weeknight outing after work, and if you’re still begging for more after the show, check out Robert Hoehn’s French Fried TV for some more hilarious comedy. 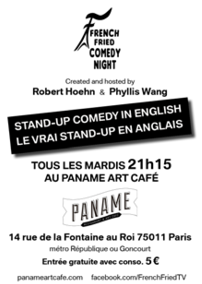 French Fried comedy night takes place every Tuesday evening at Paname Art Cafe (14 rue de la Fontaine au Roi, 75011).